Get your warm hugs and snowman kisses from your favorite Snowman. 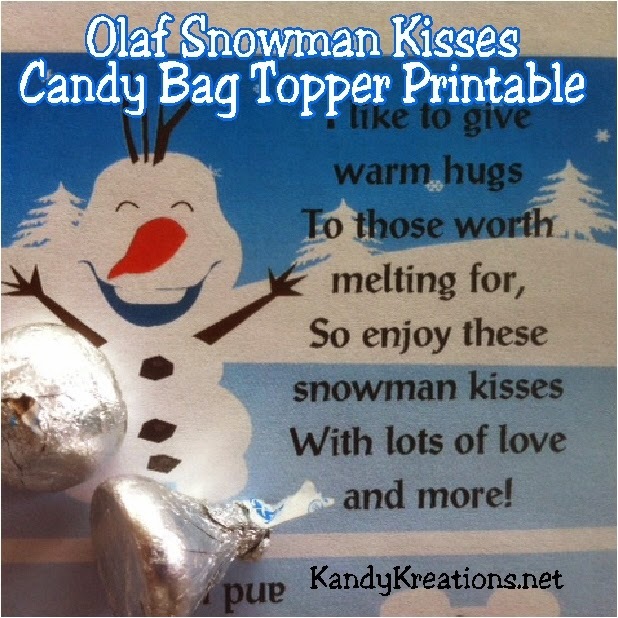 Olaf will brighten your day with this free candy bag topper printable available only for the month of January. Add some yummy Hershey kisses candies and this bag topper and you have a fun treat to warm your cold winter day. With all the snow on the ground and the cold wind biting through the air, I decided to kick off the new year with a sledding and hot chocolate party. After all, if life gives you snowballs, you might as well throw a party to celebrate, right? And with the Frozen movie theme still going strong, I knew I needed to base my sledding party around our favorite snowman, Olaf. And of course, I can't throw a party without writing a fun poem and turning it into a candy bag topper printable. So here are my Olaf Snowman Kisses. To get your own Olaf Snowman Kisses, you need to sign up for our Email Newsletter anytime during the month of January. As soon as you do, you'll get an email with the link to download and save the candy bag topper file. Then, just print your bag topper and fill with Hershey kisses for a fun treat to celebrate the month of January.